Applicata empowers eBusinesses to increase their ROI in online marketing. Benefit from proven technology, comprehensive software and expert advice. Get the actionable insights you need to further grow your business. 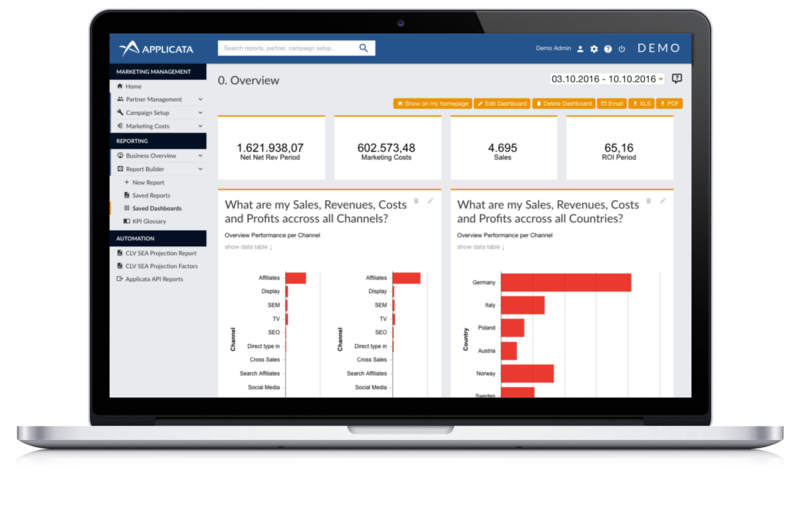 Applicata is your Full-Service BI Partner with a comprehensive Marketing Software . Together we build the software solution that gets the most out of every Marketing Euro for your eBusiness. Applicata is a powerful, scalable software built by Online Marketing and Business Intelligence (BI) experts. Together with our clients we build the perfect software solution that integrates all data sources and streamlines all marketing processes. Get all relevant metrics about the stages of your customers in one central software. We adapt the comprehensive Applicata Marketing Software to the specific needs of every client. The software processes daily more than 1 trillion data points to help our clients profitably manage more than €5 million in monthly marketing budgets across 70.000+ multi-channel campaigns. "With the help of Applicata we streamlined our marketing cost aggregation process. Now we benefit from 100% cost control across all marketing channels and the entire Customer Journey." "Applicata is the perfect partner for us to think through the changing marketing landscape. With their team we customize the software to fit our marketing processes and customer insights needs." "Applicata collects all relevant data from various sources to calculate actual and predicted Customer Lifetime Values. We export these values to Google Adwords for over 3 million keywords." Contact us today to find out how we can help grow your business. Our promise: a team member will be in touch with you within 24 business hours.